1 sheet (2 p.) : col. ill. ; 23 cm. in an attractive stage of growth. The moths live from 10 to 24 days. A. Destroy overwintering borers by disposal of infested cornstalks. wires, or chains to insure burial of all stalks. 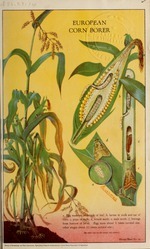 lay their eggs on the earliest-planted corn. C. Plant resistant o- tolerant kinds of hybrid corn. 2. Select types that will mature when planted moderately late. on the best hybrids to plant in your locality.